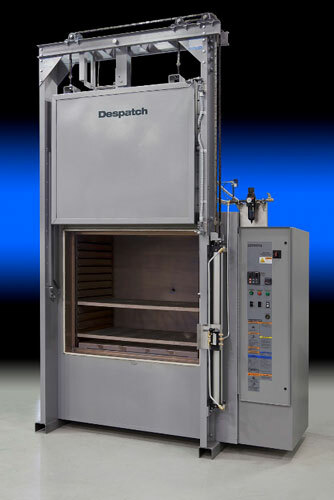 July 31, 2015 - "Press Releases"
Minneapolis, Minnesota, USA, July 29, 2015 –Due to the increasing demand for higher temperature ovens, Despatch has added the RAF and RFF high temperature ovens to its standard product line. Engineers have streamlined the manufacturing process for much faster delivery while maintaining the consistent quality control that customers have come to expect from Despatch. Despatch RAF and RFF furnaces feature horizontal recirculating airflow to ensure exceptional temperature uniformity of ±5.6°C at 538°C. These high-performance furnaces deliver temperatures up to 538°C (1000°F) and are great for such processes as annealing, aging, stress relieving and other process critical applications. The furnaces are available in cabinet and benchtop sizes (4.2, 19 and 35 cu. Ft.). The RFF is a Class A model specifically designed to meet NFPA 86 requirements for applications that include flammable solvents. This Class A furnace is complete with a pressure relief panel, purge timer, and exhaust fan. These furnaces are equipped with the Protocol 3™ microprocessor-based temperature and hi-limit controller with large LCD display and real time clock for auto start capability. The LCD display shows temperature readings along with clear, detailed information on oven status. The data-logging functionality enables reporting and analyzing and data files can be exported via the controller’s USB port. Modbus RS485 communications are included for easy data access. Despatch Industries has specialized in thermal processing for over 100 years, providing innovative solutions to critical applications in a broad range of markets and cutting edge technology worldwide.